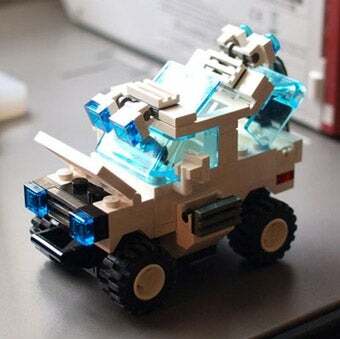 Hironobu Sakaguchi, the game developer behind Final Fantasy and Xbox 360 RPG Lost Odyssey, is hard at work on a new role-playing-game and building four-wheel-drive LEGO. "Making Legos is when I'm troubled with something," Sakaguchi blogs. "What I'm troubled with is graphic settings for the next new game project." While he says the project is going well, Sakaguchi makes LEGO when he needs to work out his ideas. What about the game itself? "Planning to basically put importance on having seamless control of the overall direction of the game, mixed with CG spectacle scenes," he continues." Controls will have a bit of a trick to it, while having a blend of RPG-type strategy and growth." Behaviors, he adds, are based on interaction with the situation around the player. Sometime later this year, Sakaguchi plans on announcing the project as well as posting model artwork and staff introductions. "With all the different elements and staff putting their 'heart and soul' into it," he writes, "it feels different from projects until now, but in a good way."